Now, I will briefly speak on my view of nanotechnology and how it has been marketed as this wondrous invention of science that will help mankind with it's many applications. I have seen more than one documentary on television portraying nanotech in a very positive light without any reference to possible health dangers. Nano particles are now in our clothes, building materials, cosmetics, pharmacetical drugs, vaccines, and food. 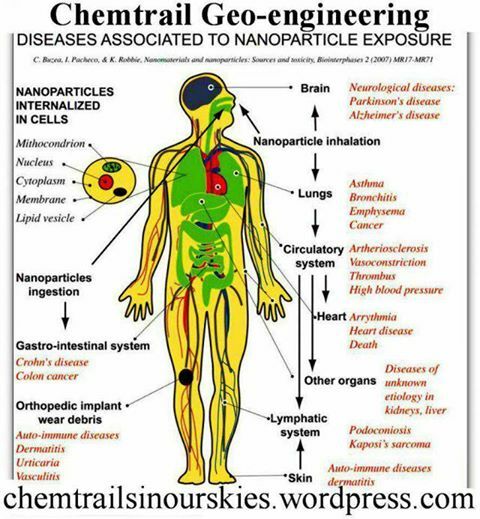 A great deal of taxpayer and corporate money are funding this nanomania without thoroughly investigating what the effects of these particles getting into our air, water, soil, animal life and we humans. Known human health risks include severe and permanent lung damage. Cell studies indicate genetic DNA damage. Extremely toxic to aquatic wildlife, nanoparticles pose clear risks to many species and threaten the global food chain. Personal products you may use daily and think are harmless—cosmetics, suntan lotion, socks, and sports clothes—may all contain atom-sized nanotech particles, some of which have been shown to sicken and kill workers in plants using nanotechnology. Known human health risks include severe and permanent lung damage. Cell studies indicate genetic DNA damage. Extremely toxic to aquatic wildlife, nanoparticles pose clear risks to many species and threaten the global food chain. Nanotech particles have been embraced by industry as the wonder ingredient in personal hygiene products, food packaging, paints, medical procedures and pharmaceuticals, even tires and auto parts, among burgeoning numbers of other consumer products. Cosmetic companies add titanium dioxide nanoparticles to sun creams to make them transparent on the skin. Sports clothing firms have introduced odor-free garments containing nanosilver particles that are twice as toxic to bacteria than bleach. Auto industry companies have added carbon nanofibers to tires and body panels to strengthen them. According to the Project on Emerging Nanotechnologies (PEN), health and fitness items continue to dominate available nanotech products, representing 60 percent of products listed. More products are based on nanoscale silver—used for its antimicrobial properties—than any other nanomaterial; 259 products (26 percent) use silver nanoparticles. PEN’s updated inventory represents products from over twenty-four countries, including the US, China, Canada, and Germany. Yet, nanomaterials are so poorly understood that scientists are unable to predict how they will behave and are unsure of how to check their safety. Over one thousand consumer products made with nanoparticles, which can be one hundred times smaller than a virus, are already on the market, despite an almost complete lack of knowledge of the dangers they pose to human health and the environment. And while these atomic-sized particles may be beneficial in certain medical applications, scientists and environmentalists are calling for more studies. Until now, few adverse effects have been found for this virtually unregulated technology. Yet, that may simply be due to the relatively few studies that have been done in the rush to find ever more and profitable nanotech applications. Nanotechnology, the science of the extremely tiny, is an important emerging industry with a projected annual market of around one trillion dollars by 2015. It involves manipulating or building new materials from atoms and molecules; silver and carbon are now the most important building blocks. The nanomaterials are far smaller than a human hair and can only be seen with powerful microscopes. A nanometer is a billionth of a meter, while a human hair is about eighty thousand nanometers wide. An atom is roughly one-third of a nanometer across, and nanoparticles are groups of atoms that are typically smaller than one hundred nanometers. The tiny-sized materials often have unique properties that differ from the properties of their larger scaled versions. Nanoparticles lend their success to the extraordinary, and sometimes highly unusual, properties they have. For example, tennis rackets made with carbon nanotubes are incredibly strong, while the larger pieces of graphite easily shear apart. The medical industry is investing heavily in nanoparticles to create precision drugs that can target specific tissues, such as cancer cells. While some of these new materials may have beneficial applications in medical procedures, wound dressings, and pharmaceuticals, concerns are growing that they may have toxic effects. In particular, nanoparticles have been linked to lung and genetic damage. In a new British study, researchers discovered an unforeseen process, dubbed “toxic gossip,” by which metal nanoparticles inflict genetic damage to DNA, even through walls of tissue that were not physically breached. Researchers called the finding “a huge surprise,” particularly since the billionth-of-a-meter-scale particles appear to have wreaked their havoc indirectly. Now, for the first time, a scientific study has established a clear and causal relationship between human contact with nanoparticles and serious health damage. According to an article published in the European Respiratory Journal by a group of Chinese researchers headed by Yuguo Song, from the Department of Occupational Medicine and Clinical Toxicology at the Beijing Chaoyang Hospital, seven young female workers fell seriously ill after working in a paint factory that used nanotechnology. The workers suffered severe and permanent lung damage, and face and arm eruptions. Two of them died, while the other five have not improved after several years. Around five hundred studies have shown nanotechnology toxicity in animal studies, in human cells, and in the environment. Although Song’s article finds evidence of clinical toxicity in human beings for the first time, according to researcher Silvia Ribeiro, this finding could be only the tip of the iceberg of an extremely risky industry. Nanoparticles behave unlike lumps of the same materials—stronger, more toxic, and with radically different properties. What makes them so useful also makes their safety so uncertain. Immediate, further research into nanoparticle toxicities and its dissemination is needed. Effects on human health and the environment result from nanoparticles reaching waterways through wastewater treatment and disposal sites, affecting the organisms that live in the water and the people who drink and cook with water. Three types of nanoparticles are of particular concern: nanosilver particles; carbon nanofibers; and “buckyballs,” or microscopic, football-shaped cages of carbon. Nanosilver is known to be highly toxic to aquatic life. While silver is safer for people than other toxics such as lead and chromium, for aquatic organisms, the story is quite different. Silver is more toxic to many fresh- and salt-water organisms, ranging from phytoplankton (at the bottom of the food chain) to marine invertebrates—such as oysters and snails—to different types of fish, especially in their immature stages. Many species of fish and shellfish, as well as their food, are susceptible; widespread exposure to silver impacts and disrupts ecosystem health. Nanosilver is significantly more toxic than lumps of silver because the tiny particles’ huge surface area increases their ability to interact with the environment. Nanosilver has been shown to break down and leach into water systems when, for example, sports garments incorporating silver nanoparticles for odor control are agitated in washing machines. In one study of silver nanoparticles used as antimicrobials in fabrics, of seven nanoparticle fabrics tested, four of them lost 20 percent to 35 percent of their silver in the first wash, and one brand lost half of its silver content in just two washings—all of which drained directly into the environment. Many waterways are just recovering from high levels of silver introduced by the photography industry during the twentieth century. New silver nanoparticle products may result in highly toxic levels of silver being reintroduced into rivers and lakes through water treatment facilities. Carbon nanofibers, which are added to tires and woven into clothing to produce different colors without using dyes, are also likely to be shed where they can be inhaled and cause lung damage. In a study published in the Journal of Molecular Cell Biology, Chinese researchers discovered that a class of nanoparticles being widely developed in medicine—ployamidoamine dendrimers (PAMAMs)—cause lung damage by triggering a type of programmed cell death known as autophagic cell death. And finally, carbon-based “buckyballs” have shown to be absorbed by simple organisms, raising concerns that toxicities contaminate the food chain at the most damaging lower levels. Today, according to PEN, over one thousand nanotechnology-enabled products have been made available to consumers around the world. The most recent update to the group’s three-and-a-half-year-old inventory reflects the increasing use of the tiny particles in everything from conventional products like non-stick cookware and lighter, stronger tennis racquets, to more unique items such as wearable sensors that monitor posture. We found this story interesting because the research is an initial step toward defining how much consumer products contribute to silver nanoparticles in the environment. Knowing the amount of a chemical entering the environment is a necessary step in estimating the risk the contaminant poses to the environment and to human health. On a larger scale, this story also intrigued us because the questions it raises reflect unanswered concerns about nanotechnology in general. This story was not widely reported. Short write-ups appeared in the New York Times and Chemical & Engineering News. Environmental Health News reported on an interesting follow-up in Particle and Fibre Toxicology, which found that silver nanoparticles are released from nanoparticle-treated fabrics when exposed to artificial human sweat. So a picture is emerging of silver nanoparticles exiting consumer products, exposing humans and entering wastewater to a greater extent than may have been intended. Meanwhile, in articles in Environmental Health Perspectives and Small, other researchers have demonstrated the adverse effects of silver nanoparticles on developing nerve cells and fish embryos, respectively. The intent is not to target silver nanoparticles but rather bring attention to a broader topic: the safety of nanotechnology. The great potential of nanotechnology to revolutionize a broad array of fields—including energy production and management, health care, and manufacturing—is gradually being realized. Yet, nanotechnology also provides great challenges in safety assessment. The composition, size and structure of nanoparticles are some of the numerous factors that influence how they act in the body or in the environment. Additionally, nanoparticles of a particular type, such as silver, do not necessarily act as individual molecules or atoms of the same substance, such as free, ionic silver. Unfortunately, regulatory agencies have been slow to contend with the rapid emergence of nanotechnology in the workplace and in the home, as well as in the environment in a broader sense, resulting in a dizzying catch-up game in which the applications of nanotechnology continue to multiply while the regulatory playing field has still not been established. Current debate centers on whether existing safety data is sufficient for nanoparticle-containing products, or whether further assessment of the impacts on human and environmental health needs to be performed. The past century provides numerous examples of chemicals—lead, dichlorodiphenyltrichloroethane (DDT), and polychlorinated biphenyls (PCBs) to name a few—that were considered a great boon initially, but were later shown to have adverse effects on human or environmental health that outweighed their benefits. Our reporting aspires to help society remember the lessons of the past and to exercise caution as it embraces the promise of the future. Thanks for a great post - we need to have a lot more info about these dangers which rarely are aired in media! You are welcome. Yes, you are right. The public needs to be informed about this growing health hazard. Shall We Hang Onto Our Old Clothes?